Renfrewshire’s best young business brains showed they were on the ball when they presented their ideas for a St Mirren football museum to club bosses. The 30 teenagers from the area’s Recruit programme impressed with their business plans for how the memorabilia extravaganza could work at the club. The Recruit is a council-run youth employment project loosely based on telly favourite The Apprentice, which sees young hopefuls compete through a series of business-based challenges, with jobs on offer for the winners. The hugely-popular programme has taken place in Renfrewshire since 2010, but this summer sees two editions running simultaneously – one for S5/6 pupils, and another for unemployed 16-19-year-olds. This task saw the youngsters from the S5/6 group asked to locate St Mirren memorabilia – with tickets, programmes, strips, old photos and even a ball dating back to the club’s foundation in 1877 among the items tracked down and pictured. The teams then presented their plans for the museum, detailing how they would market and run the facility and what its website would look like. The event took place in the home dressing room at St Mirren Park, before a judging panel of club community coaches Brian Sproul, Steven Sweeney and Gary Hocknull. The group winners were Team Cutting Edge – Jatinder Singh, 16, of St Benedict’s High; Nicola Edoni, 16, of Trinity High; Kaitlin Douglas, 17, of Johnstone High; and David Pirie, 17, who has just left Paisley Grammar. There was also an individual winner – Gleniffer High pupil Ross Mills, 16, of Team Stratosphere – who impressed the panel with his presenting skills and enthusiasm. Councillor Roy Glen, Convener of Renfrewshire’s Employment and Economic Development taskforce, said: “Tackling youth unemployment is a big priority for the council, and schemes like The Recruit are a big part of that. “The Recruit programme has been so popular that it has grown in size over each of the three years it has been running and that is testament to its success. Some of the other tasks which this year’s Recruits have already taken part in include a week-long army-style residential camp and other career-focussed training. The two programmes will continue to run over the summer, with the Top Recruits set to be crowned at a finale event to be held in Paisley Town Hall in August. 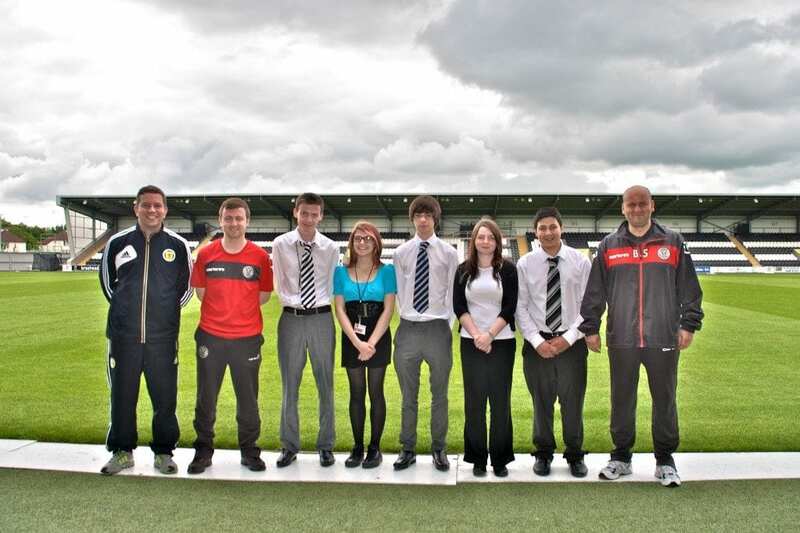 One picture attached: (l to r) Gary Hocknull, Steven Sweeney, David Pirie, Nicola Edoni, Ross Mills, Kaitlin Douglas and Brian Sproul, at St Mirren Park.